Electrician in Albany NY Archives - Page 2 of 5 - Lammon Electric LLC. 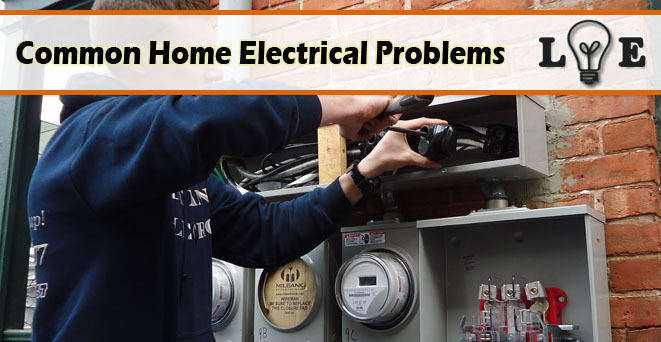 If you are searching for “Common Home Electrical Problems” this article should help! Here we have a list of common electrical issues that happen within the wiring system of your home. After each electrical issue, there is an explanation, resource from this site, or a resource from another site. An electrical surge can happen because of damage to power lines, bad electrical wiring in the house, lightning strikes, and faulty appliances. While the actual surge only lasts just a microsecond, frequent surging can cause damage to your electrical system in your home, which degrades their life expectancy. If you have frequent surging, then the cause may be an electrical device that is connected to the wiring or home grid. Try to remove any cheaply made items or power-boards from the outlet to see if the surges stop. Otherwise, it could be time to talk to an electrician. Just like electrical surges, dips and sags in your electrical supply can be caused by devices on the power grid that are made cheaply or are faulty, and it will draw a lot of power when it is turned on. A dimmer switch which doesn’t adjust the lights correctly can be caused by cheap products or bad workmanship. If you just recently moved to a new home and see that the switches don’t activate any type of light, then it could be a possible sign that the switches are unconnected, and the fixtures have been removed or it may be faulty outlet, wiring, or circuit. Talk with your local electrician if you are noticing issues with the switches that are in your home. High wattage items like hair dryers and microwaves can trip a breaker, especially when other power consuming items are on the same circuit. A circuit breaker is made to protect you as well as your home, so when it is tripped then it’s a sign that it’s doing its job. Take notice to what you are using when the breaker gets tripped. If it was your hair dryer, then try using the low setting. Also limit the electrical usage on a single circuit while other high wattage items are being used. Spread your electrical needs around. Don’t overload a single circuit. Never daisy chain power boards. Be mindful how the devices are connected in your home – what is being used, and what isn’t needed. Remove the devices that are not being used (for instance, phone charges will draw power when not connected to a phone). Bad main neutral connection: This will keep causing issues in the home until it is fixed by a professional. Different types of lights with varying wattage: Check that the bulbs are identical. Electrical shocks are nasty things. Even though they are often mild, something comparable to static shock, they will remind you that electricity is dangerous when not being properly used. Electrical shocks will normally happen whenever you turn an item off or on. The issue could be within the item, or it could be wiring. You can test this by plugging in another item and see if you get shocked again. In most cases, it is best to talk to an electrician. Patching leaks in your hot water system. Repairing damaged circuits or wiring. Unplugging chargers and appliances when not in use. Identifying electrical devices that can cause power surges. Switching to a cost effective electric provider. If the lights are flickering, then you probably have a poor connection on the circuit. If it s a dimmer switch, then there is too much total wattage for the switch. Bad wiring on the main. Bad wiring on the circuit. Insulation is too close to the light. The wattage of the bulb is too high. Isolating the whole issue could be hard. If you have been going through light bulbs constantly, then it is best if you reach out to an electrician to find the cause. Recessed lighting such as downlights are made with safety devices that will cut the power to the light when it gets too hot. You are either using a high wattage bulb or the insulation is too close to the bulb. What is the total wattage for the circuit? Overheated lighting is a fire risk, so be sure to test for overheating regularly. The light bulbs are blowing quite often. There could be a lot of reasons for this, but it depends on how widespread the issue is and if the bulbs are best for your situation. The lights are blinking or flickering. This often means that there is poor connection inside of the circuit. If the blinking is happening in most areas of the home, then there could be an issue with main wire connection. The recessed light keeps going off and it will work later again. This is most likely a built-in safety feature to keep the light from overheating. It is letting you know that the bulb is either the wrong watt, wrong bulb style, or that the insulation is causing the light to heat up. Some of the lights are running dim while others are extra bright. Light bulbs could be popping and some appliances may have quit recently. This will steadily cause damage to your home equipment. It is a bad neutral connection connected to 2 circuits or on its own circuit. Lights or outlets have went dead. If you have reset the GFCIs or breakers, if you know how, then you are most likely left with a poor connection within the circuit. Find the location of this open circuit. Half of the outlet is working, but the other half doesn’t. After years in your home, you may not know that only part may be energized by the wall switch. The other cause is use has loosened the hold on the part that cords plug into. The outlets have gone dead outdoors, garage, bathrooms or kitchen. The outlets in these areas have been required since the 1970s to go dead by a GFI or ground fault interrupter, when it senses an issue. One of these devices have been tripped and that is why it has went dead. Circuit breaker or outlet has been tripped and it won’t reset. Do not be tempted to blame the GFI or breaker. It is most likely responding to a condition somewhere else to be protected. To find what it could be, look at the diagnostic tree. The circuit breaker is tripped whenever the hair dryer or microwave is used. If isn’t tripped right away, these items may be too much for the circuit. These overloads can be avoided by limiting the use of other items on the circuit. Having a new circuit for these items will be the only solution. Most hair dryers will have a setting for low wattage that could help. Wall switches gets hot. Sometimes a dimming switch will do this and it is normal when you are running less than 600 watts of bulbs. Heat at the receptacle is different. This means that the connection needs to be improved right away. The 2 switches that control a set of lights don’t always work correctly. Sometimes the switch goes bad. Most often this comes from replacing the switch incorrectly. The switch doesn’t control anything. If you aren’t the first owner of the home, or you recently replaced receptacles, the switched receptacles may have been disabled by how they were replaced. This often applies to living rooms and bedrooms. The dryer isn’t heating up, just like the old one. There may be a poor connection at the dryer’s circuit breaker or receptacle. If you have a fusebox, then one of the two fuses for the dryer may be blown. Our electric bill is much higher than normal. One big issue that causes this is a leak from the hot water pipe. Even just one drip, assuming that the water heater is electric, is costing you money. But there are a lot of possibilities. Lammon Electric is a licensed electrician in Albany, NY offering electrical repair services in Albany, Troy, Delmar and more.